Bloomer Cut. Image courtesy Sue Fawn Chung. Central Pacific Railroad (CPP) began work on the western portion of the transcontinental railroad in Sacramento on January 8, 1863. By the spring of 1864, workers dug a railroad grade with picks shovels for 33 miles towards the northeast until they encountered their first significant obstacle in the form of a long, tall ridge at Bloomer Ranch about 1 mile short of reaching Auburn. 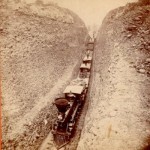 Engineers could not design the railroad to climb over the ridge because it was too steep of a grade for railroads. 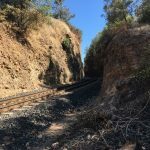 Therefore engineers designed a railroad bed that would penetrate 800 feet through the ridge and cut as deep as 63 feet at the center of the ridge. Normally, going through such an obstacle would not be a problem, but this ridge was made of a rock suspended in clay, which effectively formed a massive, natural, concrete wall. The natural concrete broke picks, shovels, and other equipment, and therefore CPP decided to use black blasting powder. But even blasting proved difficult because holes needed to be drilled into the hard concrete-like rock for holding the powder. 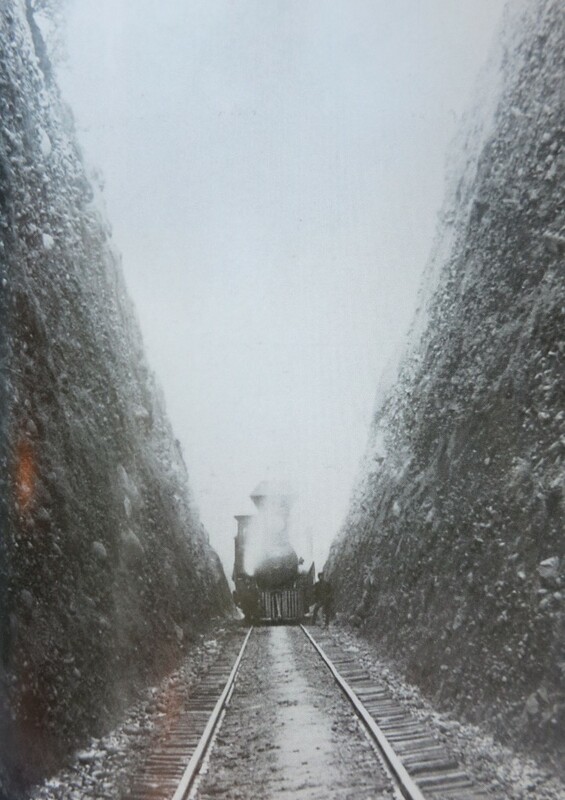 Although the narrow pathway through Bloomer Cut does not follow current day railroad clearance standards, regulators made an exception to the Bloomer Cut clearance because the walls were so solid. The concrete-like walls have preserved Bloomers Cut well, and Bloomers Cut looks virtually the same as it did in 1865. However, development did threaten Bloomer Cut; developers proposed a bridge over Bloomer Cut and widening Bloomers Cut for another track. Fortunately, none of these proposals moved forward. However, the threat of development remains on the vacant land across from Bloomer Cut. Now trains generally move westerly through Bloomer Cut while trains move east on another set of parallel tracks about 0.5 miles north of the Bloomer Cut. Bloomer Cut, Placer County. Image courtesy Sue Fawn Chung. Traveling east on I-80, exit at Maple Street (Exit 199A). Keep to your right in the “Y” intersection and travel less than 0.1 mi on Lincoln Way to another “Y” intersection. Keep to your right on Sacramento Street, and travel 0.2 miles to a 4-way intersection. Turn right on Auburn-Folsom Road, and travel 1.0 mile to a 4-way intersection, and turn right on Herdal Drive. Travel less than 0.2 miles to the end of the Herdal Drive, and park at the dead-end. Continue east hiking through a green belt alley for another 0.2 miles until you reach the cut. Union Pacific owns the railroad tracks, and it is dangerous to venture into Bloomer Cut on foot because the quietly, coasting trains are difficult to detect around the blind corner; and it is difficult to clear the train once inside the narrow Bloomer Cut.